Released in June 2009 for every system bigger than a phone, Tiger Woods PGA Tour '10 has Tiger Woods, still the world's biggest athelete, play on a variety of peaceful and idyllic courses. 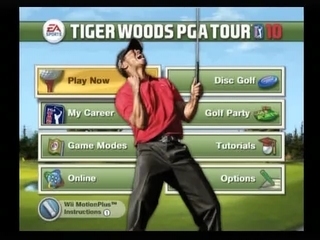 This game includes a dynamic weather system based on Weather Channel updates, and also happens to be the last time Tiger's image was displayed front, center, and solo on the box art. Best time on TPC Scottsdale course: 0:05:07 by Justin 'UCpro' Salamon on 2009-06-17. To do this as fast as possible is VERY tricky, because you have to take so many things into account on each throw, and then decide the right throwing motion, angle and percentage, and then actually make the throw. Wii motion plus is very accurate in this game... so if you make a mistake, it's because you really did throw the disc wrong. Total – 1.7 seconds total of possible improvements. This would be a round where ever disc stops quickly on the ground, which is just not going to happen. I had BY FAR the best luck I've ever had with discs stopping quickly in this run, and it would be hard to have better luck than that. However, I'm going to say it IS possible to get 5:05... but nothing lower than that realistically.